"I can't hatch brine shrimp to save my life,,,,"
I've heard this time and again and actually it is very easy to do and doesn't take any special brine shrimp hatchery to do it,,in fact some basic household items and an air pump and airstone is all that is needed. The method that I teach to people came from a book I read when I was a boy,,sadly I cannot remember which book it was,,I've never been able to find it in print since I grew up and if I do find it I will credit the author. Most books and articles today describe using an inverted 2 litre soda bottle cut this way and that,,,but for the average home aquarist that has babies for the first time and needs to feed them the soda bottle can be a bit daunting. Let me describe what you will need. 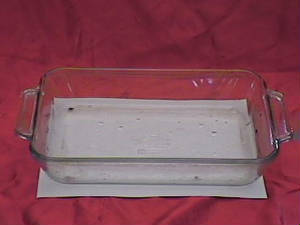 1) a two quart glass casarole dish. You need to get the rectangular one like in the picture. These are very inexpensive and most dollar stores have them. 2) an aquarium pump or source of air. Any small aquarium pump will do. 3) airline tubing and an airstone. 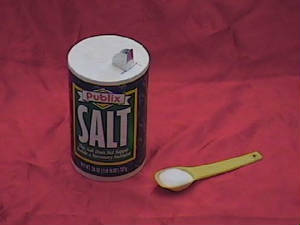 5) non iodized table salt. You can use any aquarium salt,,,but non iodized table salt usually costs less than a dollar in most stores and will last a long time. The container will look like any other container of salt except it will say, "this product does not supply iodide, a nescessary nutrient". 6) a small desk lamp or flashlight. 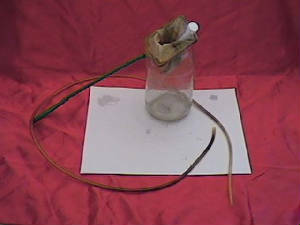 7) a brine shrimp net. These cost less than two dollars at most aquarium stores. 8) brine shrimp eggs. More on these later. 8. remove the airstone carefully,,put a light there and watch the shrimp come to the light!! 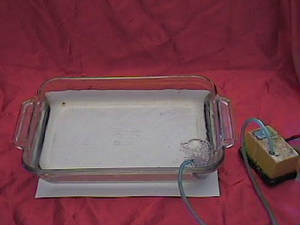 Here is the easiest way to hatch brine shrimp!!!!! Step number one: Get a 2 quart cassarole dish and place it where you want to hatch the shrimp. An elevated table will be good because you will possibly be siphoning out the shrimp, so you will need to have a place lower than the dish to place your brine shrimp net. 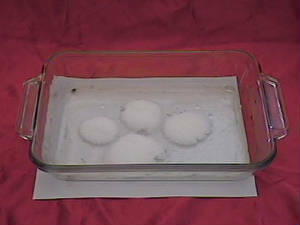 Step number two: Place 4 tablespoons of non iodized salt in dish(as described above). You could also use water from a marine tank if you have one,,or get premixed seawater from any well equipped store,,,it is easier to use table salt. Step number three: Fill the dish with two quarts(a little less) of water. This is one of the few times I recommend paying attention to pH,,the water needs to be above neutral,,so if your water is below 7.0 you will need to adjust it higher,,8.0 is better,,but please, adjust the pH before you put it in the cassarole dish. If soft water is a problem just go to a friend or family member's house who has a harder higher ph type water and fill some water jugs and bring them home,,this is easier. Step number four: Place airstone in corner of dish. It must be in the corner. This way when the eggs hatch they will be blown to the other side of the dish. Step number five: Put brine shrimp eggs in the water. See followup notes at bottom of page regarding amount of shrimp eggs to use. IMPORTANT!! Step number six: Wait 24 hours. Pull out airstone SLOWLY AND CAREFULLY. Do not stir the dish up at this point. Step number seven: Place a small desk lamp or flashlight near corner where you had the airstone. 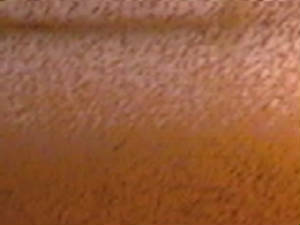 In five to ten minutes the corner of dish will be teeming with orange healthy baby brine shrimp waiting to be eaten. 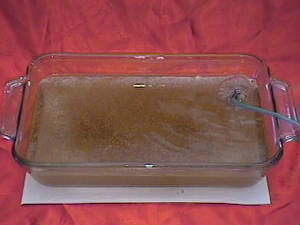 Step number eight: Either siphon brine shrimp out of dish at the corner into a brine shrimp net or use a syringe. I use a jar as in the picture with the net in the top,,,I siphon water out of the dish into the jar,,so the water goes through the shrimp net. Obviously the shrimp are in the net,,,some people rinse the shrimp,,I do not. The minuscule amount of salt that you will be introducing will not harm anyone,,and at the worst, will actually benefit the fish. You could use a syringe to remove the shrimp,,or a turkey baster,,,or an ear syringe that you use in small children,,the trick though is to not disturb the water in the dish too much,,all of the eggshells have been blown to the other end and you do not want to include these with the shrimp,,they are bad for baby fish. Step number nine: Feed to your fish. Step number ten: Start a new dish. If you start a dish in the morning and at night,two dishes side by side you will have shrimp in the morning and at night. You want to prepare just enough shrimp for one feeding,,baby brine shrimp start to lose their food value after 8-10 hours,,,so if you hatch just enough shrimp for one feeding each time you will be supplying the very best food for baby fish. 9. Look at all the shrimp! Yummy! How many brine shrimp eggs should I use at one hatching?????? Ahh the magic question,,it is easy really. If you are feeding,,say,,an average brood of baby guppies or platys,,then 1/16th of a teaspoon would be fine. The eggs are very small and they hatch out into a bunch of shrimp. 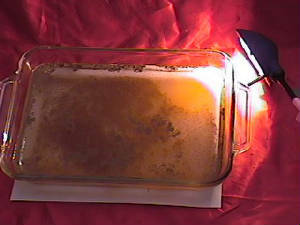 The picture that I used here shows a tablespoon of eggs,,it is ALOT of shrimp. The trick is to not waste them, they are expensive, and if you don't feed them all right away they get less and less valuble as the hours wear on. 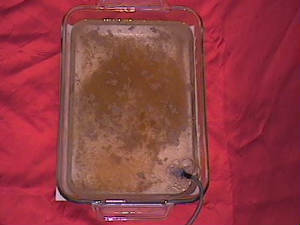 Brine shrimp get a bad rap,,they are without question, the best food for newborn fish. At the point of hatching they contain more fatty acids and nutrients consistantly than any other food. They are easy to hatch and take up very little space to do it. Inverted soda bottle hatcheries in my opinion are not good. They are designed on the belief that brine shrimp eggs float to the surface and the nauplii, as baby shrimp are called, will come out the bottom. The fact is that all of the shells DO NOT FLOAT and one of the complaints many breeders have is that the shells cause problems to their fry and this is why they go to micro worms or vinegar eels. Using the method I have shown you will ensure that you get minimum amounts of eggshells in your feed. Once you hatch them many times, you will see that the shells both float AND SINK, and researchers have found that it depends on the size of the egg and where it was collected. There is a procedure that is called decapsulating, which I may post on my site at some point,,this guarantees no egg shells. 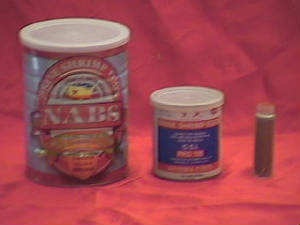 Brands and sizes of shrimp egg containers vary, and generally speaking the little tubes that you buy in the stores produce a poor hatch rate and sometimes do not hatch at all,,,,try to buy the vacuum packed cans, the large cans, 15oz, can be gotten on Aquabid.Com for less than $25 including shipping,,,they will go A VERY LONG WAY. If you try hatching shrimp and they so not work look at the water temperature,,shrimp eggs hatch quickly in warmer water,,if the water temp is below 75 degrees then they will be difficult to hatch. If you are having a hard time with them just e-mail me and I will help you!